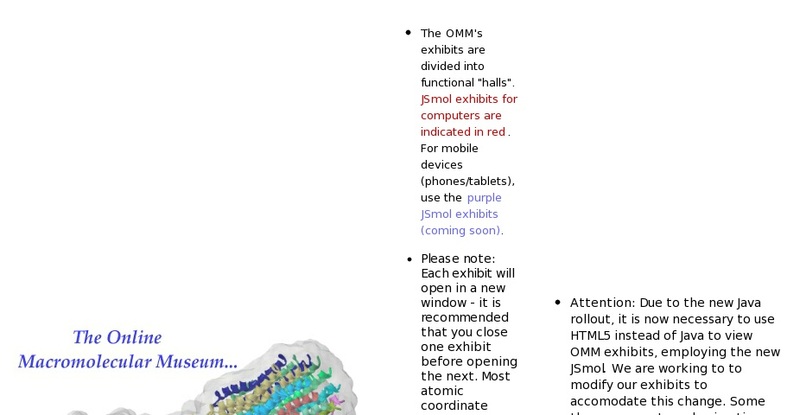 The Online Macromolecular Museum (OMM) is a site for the display and study of macromolecules. Macromolecular structures, as discovered by crystallographic or NMR methods, are scientific objects in much the same sense as fossil bones or dried specimens: they can be archived, studied, and displayed in aesthetically pleasing, educational exhibits. Hence, a museum seems an appropriate designation for the collection of displays at the OMM. The OMM's exhibits are interactive tutorials on individual molecules in which hypertextual explanations of important biochemical features are linked to illustrative renderings of the molecule at hand.